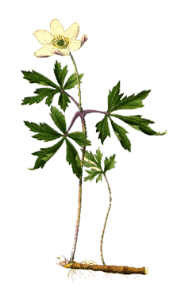 Wood anemone and yellow anemone are two different species. It is easy to distinguish between them, for example on the flower colour, but it is not always easy to recognise different species. It is important to think about what a species is. How do we define a species, and what species definition should we use? According to the traditional species definition a species should be composed of individuals similar to each other. Then the difference between species is that they look different. Humans look similar to each other, but show no close resemblance to chimpanzees, which belong to another species. This species definition seems to work well, but when studying nature closer it becomes obvious that it is not always that simple. There are for example groups of individuals that superficially are very similar to each other but seem to be different species when studying their chemistry. According to another species definition all individuals within a species should be able to interbreed and have fertile offspring. The problem then is that some groups are composed of individuals similar to each other but which cannot interbreed at all. Should then each individual be called a species? No matter how much scientists try to find a good species definition, there is none that can be used for all groups of organisms. Therefore, there is always an active species definition debate going on among scientists in Systematics.